Inman Select was launched to provide real estate agents and brokers with a reliable, specific source for the news and information they need to thrive in the real estate industry. And it’s helped hundreds of real estate professionals identify areas for improvement, plan and execute change and stay on top of rapid industry shifts as legal issues, technological advancementsand consumer sentiment changes how business is done. 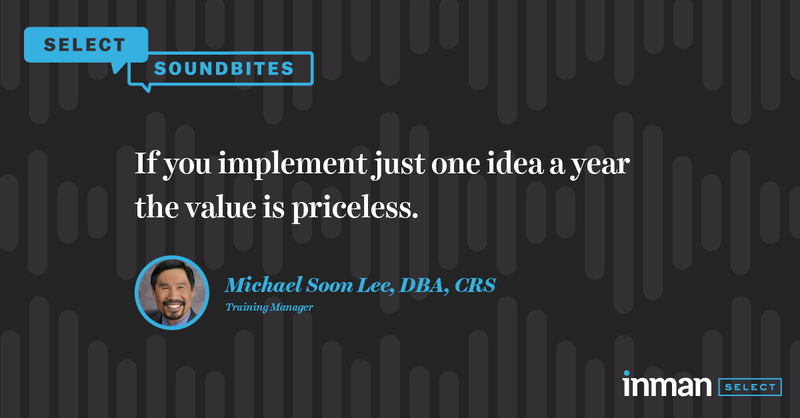 Michael Soon Lee has been a real estate broker, speaker and author for more than 40 years, and he says he has “never found a resource as valuable as Select.” He’s been subscribing to Inman Select for three years and uses it to help guide his business and his clients. My greatest accomplishment is having the privilege of serving thousands of homebuyers and sellers over the past 40 years. This past December, there was an article reminding us to take advantage of the slow holiday season. I contacted all of the expired listings in my area and discovered that one was the brother of my next-door neighbor. We are now talking. We’ll see where it leads! If you implement just one idea a year, the value is priceless! Not be as successful as I want it to be. Want to connect with Michael? You can find him online, Facebook, YouTube and LinkedIn. Email Shawna Strayhorn, Director of Subscriber Growth, to share your Select Sound Bite!